Schellers bike shop Louisville brings you a report on the most common collisions from the very well researched website Bicyclesafe.com. You're riding the wrong way (against traffic, on the left-hand side of the street). 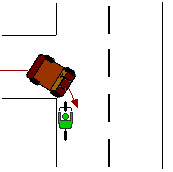 A car makes a right turn from a side street, driveway, or parking lot, right into you. They did not see you because they were looking for traffic only on their left, not on their right. They did not expect that someone would be coming at them from the wrong direction. Riding against traffic might seem like a good idea because you can see the cars that are passing you, but it is much safer to ride with traffic.